Claude Giroux has often been the good cop in the Flyers' locker room. With Wayne Simmonds gone, the team might need a new bad cop. I’ve always defended Claude Giroux as the Flyers’ captain, always thought of him as someone who quietly leads by example. No one cares more than No. 28. No one takes losses harder. But — and you knew a but was coming, didn’t you? — I now believe the Flyers need more from their leadership group, Giroux included. Now that Wayne Simmonds is no longer here, the Flyers need a veteran who will get in the faces of his teammates when needed. That’s not Giroux’s style. He played good cop, and Simmonds was the bad cop. From here, not only do the Flyers need to add three major pieces — a No. 2 center, a top-nine winger who can score 25 goals, and a first-pair defenseman such as Winnipeg’s Jacob Trouba, who is rumored to be available — but they also need to find players who fit those roles and have strong personalities. Guys who have a “follow me” attitude. Chris Pronger was like that. Players who have talent and leadership qualities aren’t easy to find, but that should be general manager Chuck Fletcher’s mission this offseason. Travis Konecny and Ivan Provorov fit that description. 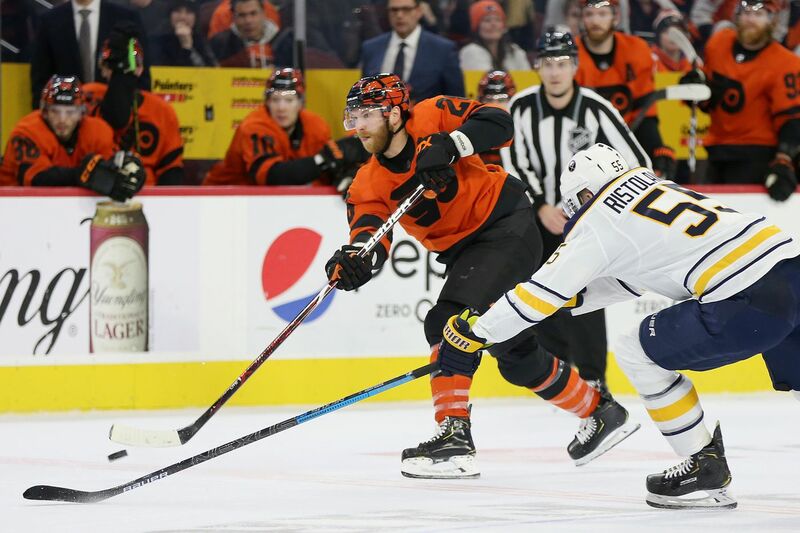 It was embarrassing how the Flyers, who admirably got back into the playoff race with an 18-4-2 run, looked as if they quit after they were officially eliminated, losing their next three games by a combined 16-5. That’s on the team’s leaders. Giroux said the slow starts to seasons have been an all-too-familiar reason that the team has missed the playoffs in four of the last seven years. That falls on the coaches and leaders for allowing Groundhog Day to be their identity during those seasons. Ditto the slow starts to games. The Flyers have faced a 2-0 deficit in a startling 31 games this season, winning just four of them. Pronger’s voice would have peeled the paint off the locker-room walls if the Flyers had continually fallen behind by two goals. This team just shrugs it off and says it has to be better. More swagger is needed in the locker room and on the ice. That swagger was missing this season, especially at home, where the Flyers, embarrassingly, had just their second losing record in 24 seasons. Remember when visiting teams felt uncomfortable playing in Philadelphia? Remember when opposing players got what was called the “Philadelphia Flu” because they didn’t want to play in the City of Brotherly Shove? The game is different now, of course. Not as much hitting. Not as much intimidation. Hardly any fighting. Still, the good teams bring juice to their home games. And some snarl. That was missing this season. The Wells Fargo Center is no longer a place where opponents dread playing. Fans were relatively quiet for most of the season, except when Carter Hart was making big saves. The players were relatively quiet, too, failing to bring the energy that is usually prevalent on home ice. Bryce Harper has created energy at Citizens Bank Park because of his talent and swagger. Both characteristics have lifted a fan base that had gone silent for several years. Now Fletcher should swing for the fences, too. Maybe he can sign soon-to-be-free agent Artemi Panarin, a dynamic left winger who plays with unbridled passion. Maybe he can work out a blockbuster trade with the sad-sack Kings, who are hungry for young players, for a great defenseman and leader such as Drew Doughty, provided he tears up his no-movement clause. Or maybe he signs an offer sheet for restricted free agent Mitch Marner, the standout Toronto right winger who will turn 22 next month and is regarded as one of the game’s best young leaders. Or maybe he can fill his needs through trades and add one of the league’s best captains, former Flyer Justin Williams, a potential free agent who is contemplating retirement but is still going strong at 37 and has 23 goals and 53 points for Carolina. Make no mistake: Upgrading the roster should be the Flyers’ first priority in the offseason. But this team also needs to add a leader or two who can show the young players the way.